Extrusion process is useful in the creation of objects having a fixed cross-sectional profile. These profiles have various shapes like solid round, rectangular, etc. 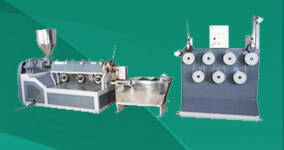 A number of Extrusion Materials are used to develop extruded products. Some of the common materials include Aluminium, Copper and their alloys. Plastic extrusion involves melting and forming of raw plastic material into a continuous profile and products such as pipe / tube, window frames, adhesive tape, etc. There are various types of Plastic Extruders that are used to manufacture a wide range of products by extruding an assortment of plastic materials. Plastic Extrusion requires a number of efficient machines for carrying out different processes for developing a wide range of reliable plastic products. One of the most important component of extrusion machinery, drives turn the motors and control the process of melting and feeding of the resin.